"I help consumer-facing companies accelerate and scale their digital transformation efforts." I started as an intern in Accenture’s marketing department, where I handled digital marketing, public relations and corporate communications for Accenture in Singapore. In this role, I managed social media handles, proposed media bylines and wrote for our internal communications portal. During my internship, I worked on an exciting project, helping to coordinate our International Women’s Day campaign. 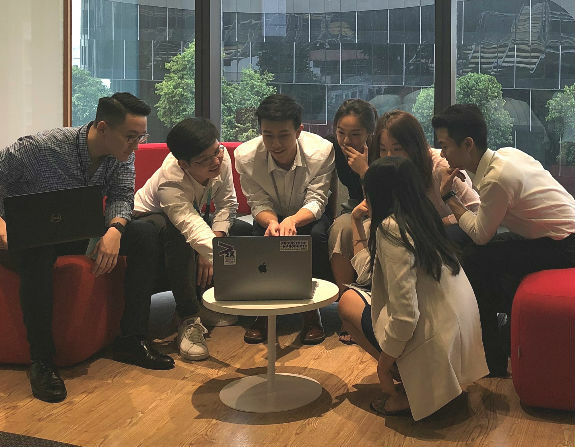 We launched an internal workplace campaign featuring inspiring women of Accenture in Singapore, as well as an external campaign that promoted our Getting to Equal research. I’ve now transitioned to a full-time role as an Innovation Consulting Analyst, helping consumer-facing companies accelerate and scale their digital transformation efforts. As an intern, I usually started the day reviewing regional news specific to Accenture that could be shared across our digital and internal platforms. I spent a large part of my day working with project teams on various campaigns, crafting stories on how Accenture’s innovation architecture delivered impact to our clients. My work an intern helped me learn the business and more easily transition to a consulting role. Accenture people are some of the most diverse, dynamic, dedicated folks I’ve ever known. They bring a lot of enthusiasm to the work they do, which is extremely energizing! I find it empowering that the company values stewardship. Our leaders are open to having us lead and take responsibility for programs and ideas where we believe we could deliver impact and value. When I’m not working, I dabble in pottery in my spare time. It gives me the utmost joy to share and gift items I’ve made to my friends. I’ll offer a piece of advice one colleague recently gave me: Be like a duck—look calm on the surface, but always be paddling underneath. Accenture does a lot of exciting work and sometimes it might seem very overwhelming to keep up. But always keep a strong, confident mindset and you will succeed! Organization: Accenture Federal Services Location: San Antonio, TX Accenture Federal Services, a wholly owned subsidiary of Accenture LLP, is a U.S. company with offices in Arlington, Virginia. Accenture's federal business has served every cabinet-level department and 30 of the largest federal organizations. Accenture Federal Services transforms bold ideas into breakthrough outcomes for clients at defense, intelligence, public safety, civilian and military health organizations. We believe that great outcomes are everything. It’s what drives us to turn bold ideas into breakthrough solutions. By combining digital technologies with what works across the world’s leading businesses, we use agile approaches to help clients solve their toughest problems fast—the first time. So you can deliver what matters most. Count on us to help you embrace new ways of working, building for change and put customers at the core. A wholly owned subsidiary of Accenture, we bring over 30 years of experience serving the federal government, including every cabinet-level department. Our 7,200 dedicated colleagues and change makers work with our clients at the heart of the nation’s priorities in defense, intel, public safety, health and civilian to help you make a difference for the people you employ, serve and protect. The ServiceNow Business Analyst will support the implementation from proposal to delivery. Includes developing a thorough understanding of the client’s requirements then applying industry best practices and detailed knowledge of ServiceNow to design an optimal solution which supports the business process meeting or exceeding the functional requirements. Builds a trusting relationship with major project stakeholders and leads them to adoption of the best solution. Supports organizational change management (OCM) efforts by providing information on the “to be” solution. Leads quality management reviews and ensures all business and design requirements are met. Conducts application and implemented business processes demonstrations to stakeholders; may support preparation of training material and provide user training. The ServiceNow Business Analyst will work closely with the Solution/Technical Architect to ensure the solution is technically feasible and to identify areas to reduce implementation efforts. Validates the configuration of business data and supports the technical team for any required custom development. Assist or lead test plan development and execution including conducting user acceptance testing ensuring implementation meets client’s requirements. Organization: Accenture Federal ServicesLocation: Herndon, VAAccenture Federal Services, a wholly owned subsidiary of Accenture LLP, is a U.S. company with offices in Arlington, Virginia. Accenture's federal business has served every cabinet-level department and 30 of the largest federal organizations. Accenture Federal Services transforms bold ideas into breakthrough outcomes for clients at defense, intelligence, public safety, civilian and military health organizations. We believe that great outcomes are everything. It’s what drives us to turn bold ideas into breakthrough solutions. By combining digital technologies with what works across the world’s leading businesses, we use agile approaches to help clients solve their toughest problems fast—the first time. So, you can deliver what matters most. Count on us to help you embrace new ways of working, building for change and put customers at the core. A wholly owned subsidiary of Accenture, we bring over 30 years of experience serving the federal government, including every cabinet-level department. Our 7,200 dedicated colleagues and change makers work with our clients at the heart of the nation’s priorities in defense, intel, public safety, health and civilian to help you make a difference for the people you employ, serve and protect. The Pega System Architect will assist to review and analyze the technical architecture of the current Pegasystem implementation installation/configuration of each of the application component. Support the development of SDLC deliverables for technical architecture components including system administration manual, operations manual, operations manual solution architecture document, etc. The resource will work with the team and client to document functional designs and work alongside the build team to capture design detail in the SDLC deliverables. The consultant will configure the system and support the build where necessary.